When SCUBA replaced the diving helmets of the forties, IMS scientists found a new freedom to make direct observations of the complex coral reef environment. Dr. Richard Robins directed a NSF study of the feeding behavior of the Florida's coral reef fishes that involved day and night diving by three Ph.D. candidates, Walter Starck, Henry Feddern, and Bill Davis. Established as a radiocarbon dating facility for ocean waters and sediment, the Laboratory was started by Dr. Gote Ostlund and was the first of its kind in the world that monitored tritium levels and radiocarbons in the environment. Contaminated tritiated water from the nuclear tests was found to spread like a dye on the upper layers of the ocean. 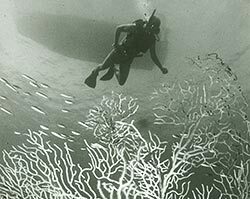 After almost twenty years, the UMML was progressing in every respect so the University reorganized it in 1961 as the Institute of Marine Science with three academic and research divisions. 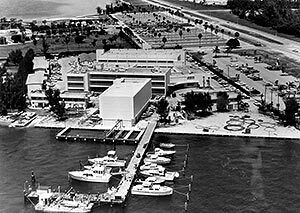 In the mid-sixties, the Virginia Key campus looked like this with the new controlled environment building (Glassell Laboratory) and its pens for sharks on the waterfront, and the physical sciences wing (Grosvenor North) completed. A temporary building housed some offices until the hoped-for Marine Science Center could be built. The Division of Physical Science was established, with Dr. Fritz Koczy as its chairman. Dr. Koczy, an Austrian scientist whose research covered the entire field of oceanography, was largely responsible for the highly successful development of the Division during the 1960s. Hydrophones and an underwater TV camera were installed on a reef one mile off the west bank of Bimini, Bahamas. The system was used to record animal sounds, and allowed the playback of sounds to the reef. This marked the beginning of the bioacoustics program at the Rosenstiel School. The 176-foot R/V John Elliott Pillsbury was commissioned, and a 65-foot T-boat was acquired from the US govenment, and named Tursiops. With funds from the National Science Foundation, the north wing was constructed, and was later named for Gilbert Hovey Grosvenor, president of the National Geographic Society from 1920 to 1954. A winter resident of Coconut Grove, he had frequently visited the Marine Lab. Located at Turkey Point, the Sea Grant Project was an aquaculture project initiated between the Institute of Marine Sciences and private corporations for the purpose of developing the cultivation of shrimp and pompano. Seven ponds were constructed for the studies. The Institute of Marine Science was formed into a school in 1969, and named the Dorothy and Lewis Rosenstiel School of Marine and Atmospheric Science (RSMAS) in recognition of a major gift from the Rosenstiel Foundation. An ambitious deep-sea drilling expedition led by the Institute’s Geology Division resulted in an unparalleled collection of sediments. In addition, a major discovery was the appearance of oil while drilling at 12,000 feet in the Gulf of Mexico. After 30 years of using temporary and converted ships as research vessels, the School was finally able to fund the construction of a 62-foot research vessel specifically for its oceanographic work. 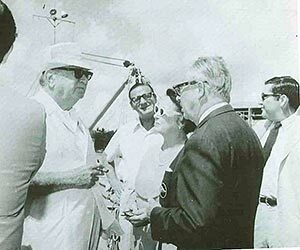 At the commissioning of R/V CALANUS in 1970, Lewis Rosenstiel (wearing hat) joined Dean and Mrs. Smith on the dock for the ceremony. 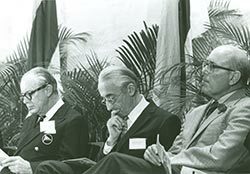 The $2.1 million Henry L. Doherty Marine Science Center was formally dedicated on February 26, 1971. Commandant Jacques-Yves Cousteau, director of the Institut Oceánographique in Monaco, was one of the guest speakers. Seated with Commandant Cousteau on the platform were Dean F.G. Walton Smith (left) and UM President Henry King Stanford. UM scientists discover a new class of reefs in Bermuda that are constructed by coralline algae and sessile gastropods and rapidly thoroughly lithified by precipitation of calcium carbonate from sea water. Thirty years since he had joined the University of Miami and started the first Marine Lab, Dr. Walton Smith announced his retirement. Former U.S. Quarantine station on Fisher Island was acquired by UM, and converted into the Comparative Sedimentology Laboratory, led by Robert Ginsburg. Pioneered by Dr. Roger Lhermitte, the development and installation of dual Doppler radar facilities made possible for the first time the observation of wind fields inside storms. The School’s new dual doppler brought international attention to its capabilities. The Rosenstiel School participated in a joint oceanographic and atmospheric research study that involved 40 vessels from nations around the world. Two of the school’s principal research vessels were involved in the six-month observational study. Dr. William W. Hay directs the groundbreaking for a wing added to the Marine Science Center for the new UM - NOAA Cooperative Institute for Marine and Atmospheric Studies (CIMAS). Created to promote concentrated research on specific problems of the ocean and atmosphere, CIMAS brought together researchers from the Rosenstiel School, NOAA and scientists visiting from around the world. Led by Dr. Samuel Gruber, a study of the role of lemon sharks as predators began. The research involved measuring, marking and releasing 1,000 lemon sharks—then monitoring their movement and behavior. The National Science Foundation assigned the coastal zone research vessel Cape Florida to UM. 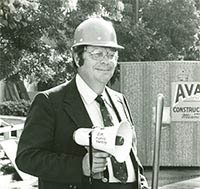 Dr. Alan Berman, assumed the post of Dean of RSMAS in 1982. 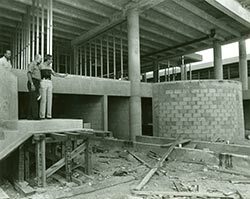 Here he checks the progress of the construction of the Science and Administration Building.